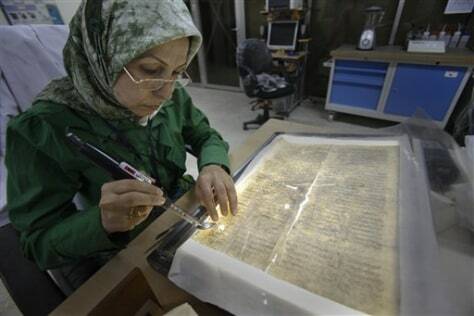 Alaa Jassim, a member of the library restoration staff, works on a damaged document at the Iraq National Library and Archives in Baghdad. A trove of Jewish books and other materials, rescued from a sewage-filled Baghdad basement during the 2003 invasion and now stored at the National Archives and Records Administration in College Park, Md. near Washington, is now caught up in a tug-of-war between the U.S. and Iraq.